At 5� 9� tall and 170 lbs. soaking wet, Pat Fischer was a freakish combination of agility, guile, and gutsy determination. A big hitter wrapped in a tiny unassuming package. The legendary Johnny Unitas was once being interviewed at Redskin�s Park when a cameraman sarcastically asked, "Hey John � who�s that 'kid' playing corner?" "That KID", Unitas reportedly replied, "is Pat Fischer, and if he hits you, he�ll knock your socks off!" And in 213 NFL games, spanning 17 seasons, the �Mouse� did just that. Born on January 2nd, 1940, in St. Edward, Nebraska, Pat Fischer loved football from the start. Attending Omaha Westside High School, he played well enough to be named to Nebraska�s All-State team. Football ran in the family, and in 1958, Pat followed older brothers Rex, Cletus, and Ken to the University of Nebraska. While nothing in his time at Nebraska hinted at the NFL career to follow, Fischer did made his mark. Playing both defensive back and halfback for mediocre Cornhusker teams from 1958�1960, he led his team each year in all-purpose yards and kick-off return yards, and was a natural leader, serving as Team Captain. Despite his successes at Nebraska, however, the tough but diminutive Fischer never dreamed he had an NFL career ahead of him. But Pat Fischer�s entire life turned out to be about defying expectations. In the 1961 NFL draft, he was selected in the 17th round by the St. Louis Cardinals (preceded 13 rounds earlier by future Redskin�s teammate Ron McDole). Fischer figured there was no way he would stick in the NFL, and was already planning to return to Nebraska to complete the 9 credit hours he needed to earn a degree, when to his astonishment, he made the team. Fischer was so small, he spent his first practices in shorts and a t-shirt while the team struggled to find equipment. Properly outfitted, Fischer quickly established a reputation for surprising quickness, impeccable instincts at the cornerback position, and administering punishing hits. From 1961�1967, he perfected his craft. He out-thought, out-reacted and out-positioned his nearly always larger and faster opponents, snaring 29 interceptions, and averaging 24.5 yds. as a kick-off returner. In 1964, in his 4th NFL season, Fischer intercepted opposing quarterbacks 10 times, and made his first of 3 appearances as an All-Pro. During Pat's years with St. Louis, the Cardinals developed a great new defensive option, the �safety blitz,� becoming the 1st NFL team to utilize the play. In order to give the safety time to reach opposing quarterbacks, Fischer himself came up with a new coverage technique, the �bump and run,� physically harassing receivers all the way down the field. The tactic so altered the game it was later banned by the league. Despite his success in St. Louis, the Mouse was not destined to spend his career a lowly Cardinal, but to wear the Burgundy and Gold. In 1968, he donned those sacred colors for the first time. The Washington Redskins liked what they saw in Pat Fischer � toughness, tenacity, and discipline � and Head Coach Otto Graham gave up second and third-round draft choices for him in 1968. It turned out to be a bargain. Fischer quickly became a fan favorite at the left cornerback position. In fact, it's rumored that Fischer was the boyhood favorite of future Redskin�s owner Daniel Snyder, who "always liked an underdog." Whether it was his contagious grin, humble blue-collar attitude or small stature that drew fans to him, one thing was for certain--Pat Fischer could play. Fischer endured yearly coaching changes in his inaugural four seasons with the Redskins; first Graham, then Vince Lombardi, then interim coach Bill Austin, and finally George Allen took the helm. They all shared one thing in common � they knew a football player when they saw one, and Pat Fischer fit the bill to perfection. Fischer had a reputation for intensity both on and off the field. Before games, he would reportedly sit for hours by himself, smoking cigarettes and envisioning the entire game in his mind. And on the field, he played with reckless abandon, a habit that would force two back surgeries upon him during his years with the Redskins, and ultimately end his career in 1977. Fellow teammate Richie Petitbon jokingly claimed that it was only Fischer�s horrible eyesight that explained his fearlessness in the defensive backfield and propensity for delivering surprisingly savage hits. But in reality, he simply had a warrior�s spirit. In 1969, playing for the legendary Vince Lombardi, Fischer�s tenacity and skill were recognized again as he earned Pro-Bowl honors along with teammates Chris Hanburger, Len Hauss, Sonny Jurgensen, Larry Brown, and Jerry Smith. Legendary Redskins athletic trainer Bubba Tyer characterized #37 as the toughest player he�d ever encountered. When Darrell Green, an NFL great in his own right, one day reportedly described himself as a more "physical" player than Fischer, Tyer claimed all he could think was, "yeah, right." Over the course of his Redskins career, Fischer, along with stars like Jurgensen, Kilmer, Ken Houston, Larry Brown, and Charley Taylor, would help lead his team to the playoffs five times, including 1972�s Super Bowl VII, a loss against Miami in their �perfect season�. He, and the rest of the �Over the Hill Gang� developed a reputation for tough, opportunistic, overachieving play, particularly during the reign of another Redskins legend, Coach George Allen. Pat Fischer was an anecdote-teller�s dream. He was rumored to be fond of chewing on a mouthful of �stick-um� to relax before games. Supposedly finding it difficult to find well-fitting knee pads, Fischer would allegedly tape disposable diapers around his knees. It was also reportedly common for Fischer to send young fans in the stands after hot coffee to warm him during cold-weather games. But it was Fischer�s on-the-field performances that contributed most strongly to his legend. On November 2nd, 1975, he became perhaps the only player ever to get Hall of Fame Cowboys quarterback Roger "Captain Cool" Staubach's proverbial goat. Following a late game interception of a Staubach pass, Fischer�s vicious hit so frustrated Staubach that the normally calm quarterback threw a punch at the cornerback, earning a 15-yard personal foul penalty. The penalty set up a come-from-behind Redskins win, culminating with Billy Kilmer�s game-winning QB sneak in overtime before a raucous and jubilant RFK crowd. Fischer was also on the losing end of another controversial play that year, which came to be known as the "Phantom Catch." Playing against the Cardinals on the road late in the season, the Redskins needed a win to take over 1st place in the division. 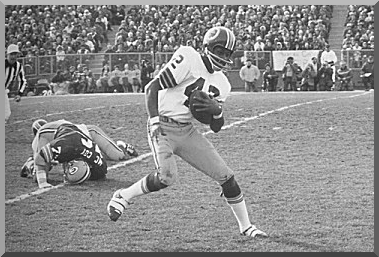 On 4th down, with less than 2:00 left in the 4th quarter and the Redskins leading, Cardinal�s QB Jim Hart launched a pass into the end-zone toward his favorite receiver, Mel Gray. As the ball hit Gray�s hands, Fischer immediately connected with him, delivering a jolting blow and knocking the ball to the ground. The officials on the field ruled it incomplete, and the Redskins began celebrating and bringing their offense on to the field. But the officials weren�t done talking. Five agonizing minutes and a ruined Redskin�s season later, the officials reversed themselves, saying Gray had come down with the ball before Fischer knocked it out. The Cardinals tied the game, sending it into overtime, where they promptly kicked a field goal and won the game. The Redskins never recovered from the loss and finished in 3rd place that year, missing the playoffs. The play was so controversial, it would later actually become the subject of a court dispute. Film evidence (The Warren Commission had nothing on the NFL) clearly shows Gray did not maintain possession on the play. Fischer had countless memorable match-ups with Mel Gray over the course of his remarkable career, as well as with another famed receiver of his day, Harold Carmichael, the 6� 7� Philadelphia Eagle receiver whom the tiny Fischer routinely dominated. He took on almost every dominating back of his era, including 237 lb Larry Csonka, 215 lb Paul Hornung, and 228 lb Jim Brown, and made his own memorable �impression� on each of them. During 213 games over 17 NFL seasons, Pat Fischer amassed 56 total interceptions (4 returned for touchdowns) for a total of 941 yards, good enough to place him 15th on the NFL�s all-time interception list (two places ahead of Darrell Green). In his final season, Fischer was still putting on gutsy performances, and still managed to reel in 5 interceptions despite playing in tremendous pain. But time and the inevitable toll of innumerable hits against larger, stronger opponents finally proved too much even for Pat Fischer, and he was forced to retire in 1977. After being knocked out of a game against the Cardinals with a concussion in his final season, a reporter asked Fischer if he was badly hurt. "Nah," replied Fischer. "I was just knocked out." Following his retirement in 1977, Fischer dabbled in training racehorses, investment banking, real estate, and public speaking. In 1995, Pat was inducted into the Nebraska Cornhusker�s Football Hall of Fame (along with two of his brothers). He is a former nominee to the Pro Football Hall of Fame in Canton, Ohio. In 2002, Fischer was recognized as one of the Washington Redskin�s 70 Greatest Redskins. Today, you may find Pat Fischer at any number of memorabilia and autograph sigings in rural Virginia. But he will always live on in the hearts and minds of Redskins fans as among the finest ever to wear the burgundy and gold. gonna have to punish you. That�s the rule." Last edited by Boone; 07-01-09 at 12:09 PM. I used to love watching Pat Fischer climb Harold Carmichael like a ladder. Man these old school stories paint an awesome time as a Skins fan back in the 70's...I'm a little jealous some of you guys got to see it. Fischer was one of my favorite players back when I was a kid/teenager. Nice job Boone! Tough and wily. I remember the way he used to casually run receivers out of bounds so they couldn't make the catch. Always one of my favorite players. He was my oldest sister's favorite. She affectionately referred to him as "Tiny Pat" and would always yell "Get him, Tiny Pat" at the TV. It wasn't until several years later that I realized what a great player he had been for the Cardinals. Perhaps a little HOF consideration from the Veteran's Committee is in order. I really hope he could make into the HOF by the veterans committee! Him and Hanburger!!! And tap dance on his kneecaps. As most of you know, I had the privilege of spending some time with Pat at the NFL Fan Flag ceremony in New York. A few things about him really stood out to me. Obviously, his size. However, you STILL don't want to take him lightly. I'm 100% confident that he would still whoop me up one side and down the other if he chose to. To this day, his grip strength is insane. I can't imagine that Andre the friggin Giant would have shaken my hand any more strongly, had I ever had that opportunity. Pat is still very, very strong. But what makes Pat, Pat, isn't his strength, or his "size," or his accomplishments on the field. What makes Pat, Pat is the simple beauty of the man as a human being. He was SO kind. I mean overwhelmingly kind. And generous? Shoot. You haven't met a generous man until you've met Pat Fischer. Huly knew him already. I had met him briefly at the NFL 5k race at National Harbor a few years earlier. So I approached her as to how to "deal" with Pat. What his personality was like, etc. And I was concerned about "bothering" him. I remember her saying, "If you want something, ask him. He loves it when someone knows who he is, and will sign anything you have." Boy was she right. When SilentThreat and I met him, along with Huly and Pez, he must've stood there and talked to us for 15 or 20 minutes. In fact, I think I politely excused us when we parted. I couldn't imagine that he wanted to stand there and talk to us THAT long. But he did. If you're a Skins fan, Pat makes his time your time. He was gracious enough to sign my flag in large letters, with his #37 beside his name. Then on my NFL-issued Fischer jersey, he signed "Pat Fischer, 1961-1977." I've told this story on the board before, but allow me to share it once more before shutting my mouth...errr....fingers. The players didn't attend the rehearsal for the flag ceremony. So it was up to the fan flag winners to explain to their player representative how it was all to go. When Pat arrived, he said, "OK, Jase. I have no idea what we're doing here, so I'm just gonna listen to you, OK? You tell me where to go. You're in charge." He was fidgeting and antsy like he was ready to take an NFL field one last time. And you can be damned sure I felt the same way; about to "come through the tunnel" with a legend. I asked him if, since I was going to be instructing him, I could tell my friends I "coached" Pat Fischer. He said, "You sure can!" So yeah, folks. I coached Pat Fischer. Chad Pennington, the Jets player rep, arrived late; just as we were getting ready to go onstage. He apologized profusely to his fan, and said they'd hang out afterwards, since they didn't get to talk beforehand. Pat, being Pat, spoke up. "Leave it to the quarterback to hold everything up! Jurgensen was the same way!" I lost it. Funny as hell. And I wasn't afraid to laugh. Had Chad taken one step toward me, I knew Pat would lay him out. He's still a flirt, and that was great to see. He was making googly eyes during the ceremony with our lovely NFL rep, Maggie. (Who looked like a younger Halle Berry.) And he just LOVED being the center of attention. I love Pat. Just love the guy. I'm afraid he's getting to the point where he won't be making a ton more public appearances, but he's just a gem of a human being. If you ever have the chance to go see him somewhere, do yourself a favor. DON'T pass it up.